Place: USGS Launch Facility, Wallops Island VA, Orbital Sciences Corp. Hangar. You will be shot into space in a 1989 Yugo Koral 55, lofted on a Pegasus XL Rocket, designed by Orbital Sciences Corporation, of Dulles VA. Players will attempt to survive, and solve interpersonal conflicts while orbiting the earth in a substandard eastern european automobile, which has been hastily pressurized with some old skin diving equipment, and 20 tubes of "Mister Gasket" sealant. How did the First Run Go! While there is no statute of limitations on murder, remember there is on negligence! We're back from Costa Rica and ready to have another go. 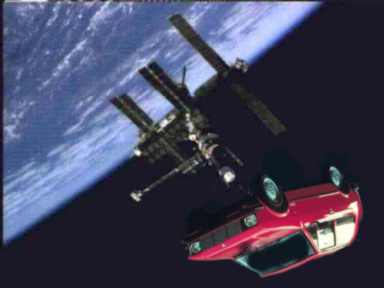 In September of 1995, seven individuals were strapped into our 1985 Yugo Koral 32, and blasted into space. After a near collision with the Mir Space Station, they re-entered the earth's atmosphere in a spectacular event that was the culmination of their live-gaming careers! Each player will receive a pressure mask, a brown paper bag, and a box of Nabisco Brand Cheeze Nabs (TM). You will also get a character sheet, contingency envelopes (with keen titles such as "open in case of explosive decompression"). Note: show me $100,000 in cash, and I'll show you a rocket!